Today's advent cartoon has no direct link to Christmas except that it has snow in it and as we all know there was snow at the first Christmas. Also the weather in Scotland has been wintry but not as wintry as last year when I was drawing Santa stuck on the M8 and people really did get stranded. Instead today we had all the media hype of major weather warning snow including the minute-by-minute as-it-happens coverage from the BBC news website but disappointingly for those outlets it wasn't too bad. Usually I like drawing snowmen at Christmas but couldn't come up with a good gag to beat last year's Empire Strikes Back cartoon and the less successful Glaswegian snowman. Still we have plenty more days left and hopefully I will get to build a real snowman for inspiration. 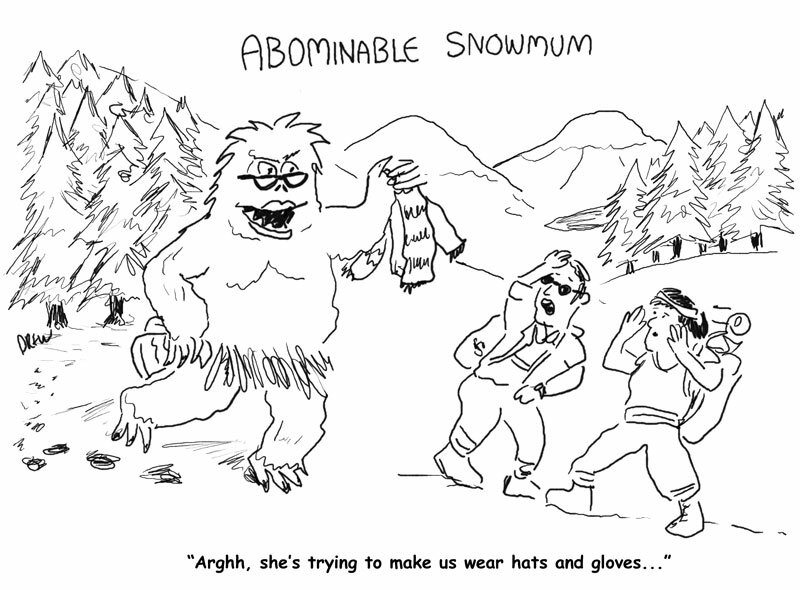 Instead you have to put up with the Abominable Snowmum mother of the fabled Yeti. In this, Big Foot and the Loch Ness monster we often forget that you need to have a population of monsters to maintain sightings as one solo Abominable Snowman or Big Foot would quickly get lonely and unable to find a mate be consigned to the pages of myth and legend.